Minister of Planning Hala El-Saeed announced that 701,000 citizens in nine governorates were screened for Hepatitis C and other non-communicable diseases, as part of the ‘100 Million Lives’ campaign, the largest-ever nationwide health campaign to eradicate hepatitis C.
El-Saeed’s statements came during a a press conference that was attended by Minister of Health Hala Zayed on Thursday evening. The planning minister noted that South Sinai and Damietta came on top of the governorates that witnessed high turnout to screening for Hepatitis C and non-communicable diseases. ‘The rate of women turnout was the highest among the citizens at 53 percent, while men stood at 43 percent. The age categories of those checked ranged between 26 to 45 years old,’ the minister explained. ‘Some 4,000 medical teams are participating in the health campaign to detect and treat hepatitis C and other chronic diseases such as high blood pressure, diabetes and obesity’, she added. 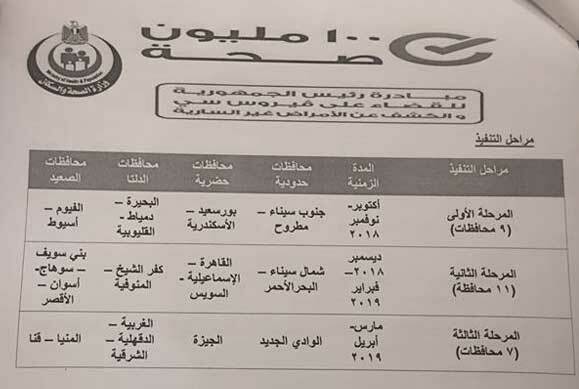 The first phase of the three-phase campaign, which took off on 1 October and will last until 30 November, includes the governorates of Damietta, South Sinai, Matrouh, Port Said, Alexandria, Beheira, Qalioubiya, Fayoum and Assiut. According to 2015 statistics, some 15 million Egyptians – or 22 percent – of then-population of 91 million carried hepatitis C.
In 2016, the health ministry achieved a 96 percent cure rate of the disease nationwide. The health ministry has vowed to completely eliminate the disease in Egypt by 2021.